Theres some things in life that are so helpful that you can't imagine living without them. 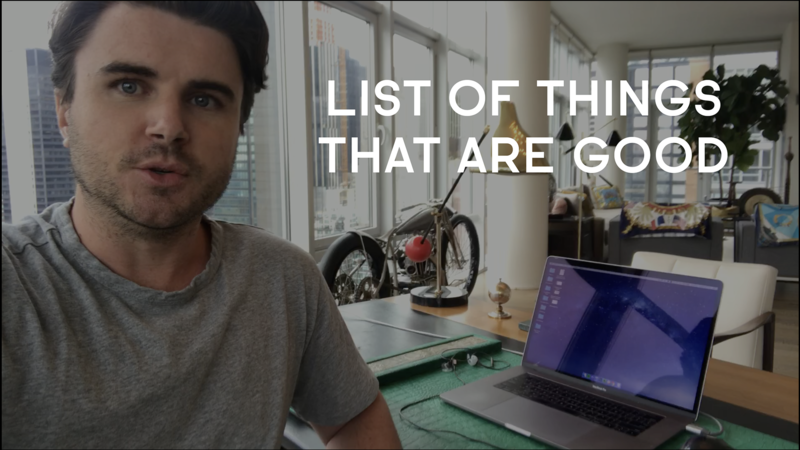 In today's video I share my official "List of things that are good". 8 things that I use everyday to be more productive, happy and healthy. Check out the video to see me tour through my NYC apartment and see what these 8 things are. Quest Bars -- Best flavor is chocolate chip cookie dough -- Link to the product here. La Croix -- Best flavors are the tall skinny cans -- Link to the product here. Bed Jet -- Link to the product here. Oura Ring -- Link to the product here. Incense sticks -- Link to the product here. Boom volume booster -- Link to the product here. Last Pass -- Link to the product here. War Map Calendar -- Link to the blog post where I discuss this in detail here. I also mentioned my favorite book from 2017, it's "Principles" by Ray Dalio. Get it on Amazon here. Give these things a try and I'm sure some of them will help you just as they've helped me! Do you already have/use some of the things I mentioned? If so -- let me know what ones in the comments section below? Hey, everyone. It's Sam Ovens. I just wanted to make this quick video to share with you guys a list of things that are good. What I mean by that is some basic, everyday things that I use in my own life that I think make it a lot better. They're just basic things. They're very cheap. Anyone can use them. I'm going to explain what they are and why I like them and why I use them. I'm guessing a lot of you, or some of you, might find these things really useful as well. What I'm going to do is I'm just going to walk around my apartment here in New York, and I'm just going to show you these different things. I'll also include a link to them below this video on the blog where you can access these things and get them for yourself if you are interested in them. So let's start this little tour. First stop is the kitchen. The first thing I want to introduce you to, number one this list, is Quest bars. There we go. They look like this. Now these Quest bars. Why I like them is ... A lot of the time I have breakfast, I have lunch, and then have dinner. But a lot of the time, in between those meals, I feel like a snack. Especially in the afternoons or the evenings, I might feel like something that's bad for me, like some chocolate or some sort of thing that's not very good me. Why I like these Quest bars is they taste pretty good. They taste like a chocolate bar almost. The cool thing about them is that you can eat them, but then there's no guilt afterwards because there's no sugar in them. Well, there's nothing really in them that's bad for you. So it doesn't matter if you have two of these a day, or whatever, compared to if you have two chocolate bars or something. That's why I like these. I noticed as soon as I started having these, I pretty much ... My cravings disappeared for chocolate bars and things like that. It allowed me to be a lot healthier. It removed that guilt that I had after bad stuff. Now we'll go over to the fridge here. I want to introduce you to number two on this list is LaCroix. These things. You can we've got a good stockpile in here. LaCroix. Why I like them is it's basically sparkling flavored water. You've probably had sparkling water before. The only difference with LaCroix is that it's flavored, and it tastes pretty damn good. Why I like these is, first of all, it pretty much tastes like a soda. It tastes like ... It's really flavorsome. It tastes really good. But the good thing about them is that there's no sugar in them. There's nothing bad in them. It's pretty much just like drinking water. And you can binge drink these things. I have six or seven of these things a day. You can drink as many of them as you want, and it's not bad for you at all. It's just like drinking water. Plus, these things are real cheap as well. You can a box of six or eight for like four or five bucks. So cheap, healthy for you, and it's just like drinking water. Also, the sparkling water part in it ... Sparkling water suppresses your appetite a bit. If you're drinking sparkling water throughout the day, you don't feel like eating as much food, which is good for health and all of that. That's pretty much my two most favorite things in the kitchen. Now, we'll walk through into the bedroom. In here, and into the sleeping area. This thing here is one of my favorite things. Look at this. This is like an air conditioner for your bed. I'll pull it out here. You can see it's called a BedJet. I'll put a link to all of these things beneath this video here on my blog. But why I like this thing ... Well, why I like this is, in the summer time, it gets really hot, and the thing about ... If you've got air conditioning in your apartment or whatever, that's great. But air conditioning doesn't get underneath the duvet or underneath the blankets or anything. So even if we have the air con blaring in this apartment, it's still hot and sweaty underneath the duvet and the sheets. That bed cooler just sits in between the bottom sheet and the top sheet. It puts in cold air in there. You can set the temperature just how you want it. And what you'll find is that your sleep gets way better. A lot of sleep quality comes from your body temperature. It's one of the main driving forces in a quality sleep. If you have quality sleep, you're going to be more productive. You're going to be more happy. You're going to make more money. All of that stuff. There is a very real ROI to having a good sleep. Therefore, there is an ROI to controlling your temperature when you're in bed. So that's why the BedJet is an awesome tool that I highly recommend. While we're in here, you can see I've got a big collection of books. I love reading. I'll just give you a quick setup. One of these books that I read recently: Principles by Ray Dalio. I'll put a link below the video. Highly recommend it. This is probably the best book that I've read in 2017. Now what we'll do is we will cruise on through to bathroom. And then, I want to introduce you to this. It's called an Oura Ring. It's on charge right now, but you can see this little thing here. It goes on your finger. You can see it's got some little electrical things on the bottom. Now, why I like this is ... The Oura Ring, it basically tracks your heart rate. It tracks your body temperature. It tracks all these different things, and it provides you with health metrics. My favorite thing about it is that it tracks your quality of sleep. It will track how many hours of sleep you had, the quality of your sleep, and all of that stuff. When you start to have a metric that shows you how good your sleep is, you can start to improve it. One of the things that I've found that helps me in business and in life the most is having a good sleep. That's why the bed cooler and the Oura Ring ... They're like the ultimate combination of tools to optimize and improve your sleep. I highly recommend the Oura Ring, and I'm going to put a link to that below this video on by blog as well. Now, we'll come out here to my home office area over here. I want to introduce you to something very simple. Some incense. One thing I really like to do when I'm working is light some incense. This stuff's super cheap, and it's very simple. Why I like it is I find it really helps me to relax. And it also helps me to focus and really get into the zone. There's been a lot of actual studies into incense. That's why they light it at the monk camps and up in the mountains with the ninjas and all of those people. But it helps you focus on your breathing. Because the incense lets off a scent, you're more focused. You're more conscious about your breathing, which helps you to breathe better, which therefore helps you to focus better and relax. I found incense to be really helpful when I'm working throughout the day. It's another one of my things on the list of things that are good. Now what we'll do is we'll cruise over to my laptop here. Now what I'm going to do is I'm just going to jump on to my laptop, and I'm going to show you a couple of tools on here that I find really help me throughout the day and in my life. We'll jump on that right now. All right. Now we're on my computer. I want to show a couple of things that really help. The first one. And this tool is seriously cool. It's called the Boom volume booster. This is available for Mac. I'm not sure if they make one for PC or not. But if you're using a PC, you should get a Mac anyway. This thing here. It boosts the volume of your sound on your Mac. It does it for both your speakers in your computer and headphones. Honestly, when you install this thing and you listen to it for the first time, your life is going to change. It dramatically improves the volume of your sound and also the quality of your sound. So I highly recommend that you install this on your Mac. It is one of the best things I've ever found, and it's so simple and so easy. So that's the first one. Like all the other things, I'm going to put a link to it below this video on our blog. Now the next one I want to show you is something called LastPass. If you're on the internet, which pretty much everyone is, then passwords are a big thing. You've got to know your username and your password for like a million different things. It's a bad idea to use the same password for everything. You really want to have good passwords that are all different so that, if one password gets leaked, your whole life isn't all at risk. So I recommend using this thing called LastPass. What it does is, if you go to any website, it pretty much autofills it. If I go to Paypal.com for example, and if I to log in here, it will show my login info, and then all I need to do is just hit "Log In" because it's grabbing it from LastPass. You can also save your credit card info and all things you really need. Really, I can go throughout the internet, on all of these different sites, and I can enter credit card info, address info, log in info for everything without ever having to type in anything. That makes you way more productive. It makes you way faster. And it also protects the security of everything because it sets a complex password like this ... You can see like this ... for all of your different stuff instead of putting your birthday or your cat's name or something like that. This is a really good hack that I highly recommend. Now, another one that I really recommend is the War Map calendar. I'll show you what that looks like right here. I talked about this in a previous blog post. This is a calendar that I like to use. It's free, and it's available in Google Docs. Anyone can use it. It's real easy to use. It's basically a way to plan your life and plan your year in advance. You have both a high-level view here, and you have a month-by-month view as well. I'm not going to talk about this one too much, because I explained it in detail in a previous blog post. Just check below this video for the link to that specific blog post. If you go there, you will be able to see all about it, learn about it, learn how you can use it, and also you will be able to access to this tool for free as well. So that's pretty much the list of things that are good, or the things that I use every day in my life to be more productive and to get more out of my day and everything. Now, like I said, all of these things are cheap. They're easy to use. They're easy to access. Everyone can really start using them today. I highly recommend that you check them out and try them for yourself. And then, what I want you to do is, if you're watching this video anywhere else other than my blog, which is at Consulting.com, then what I want you to do is head over there right now to the full post. Because over on our blog, you will be able to see the list of all of the different things that I mentioned and the links to go and access them, as well as some more detailed information. So if you're watching this video anywhere else, head over there now. Then what I want you to do is, if you liked this video, just let me know in the comment section below. I'm going to check all of these comments personally myself. It won't be my team or anything. If you've got any questions, just let me know. Or if you want to give me any feedback or say, "Hey, this was helpful." Or "Hey, this was useless." Just go ahead and do that in the comments. If you liked this video, please subscribe to our YouTube channel, because we will be releasing a lot more information like this, and we have a lot of other information like this on our channel already. So that's it for this video. Thanks for watching. And I'll see you on our next one soon.